This Castle with the Dual Slide features a special NON-SLIP material that makes this Bounce House/Slide Combo one of the safest wet/dry combos around! Bounce and cool off at the same time, play basketball, or climb and slide into the attached pool for a feel of a water park at the convenience of your own home. 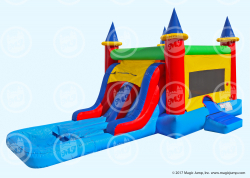 The Dual Wet or Dry Combo features a larger 15'x15' bounce house with a double slide. With a larger jumping area and two exit slides, the Dual Wet or Dry Combo doubles the fun that competitors offer and is a definite crowd pleaser. To add to the fun, it also includes a basketball hoop.